The story is told of an automaton constructed in such a way that it could play a winning game of chess, answering each move of an opponent with a countermove. A puppet in Turkish attire and with a hookah in its mouth sat before a chessboard placed on a large table. A system of mirrors created the illusion that this table was transparent from all sides. Actually, a little hunchback who was an expert chess player sat inside and guided the puppet’s hand by means of strings. One can imagine a philosophical counterpart to this device. The puppet called ‘historical materialism’ is to win all the time. It can easily be a match for anyone if it enlists the services of theology, which today, as we know, is wizened and has to keep out of sight. ‘One of the most remarkable characteristics of human nature,’ writes Lotze, ‘is, alongside so much selfishness in specific instances, the freedom from envy which the present displays toward the future.’ Reflection shows us that our image of happiness is thoroughly colored by the time to which the course of our own existence has assigned us. The kind of happiness that could arouse envy in us exists only in the air we have breathed, among people we could have talked to, women who could have given themselves to us. In other words, our image of happiness is indissolubly bound up with the image of redemption. The same applies to our view of the past, which is the concern of history. The past carries with it a temporal index by which it is referred to redemption. There is a secret agreement between past generations and the present one. Our coming was expected on earth. Like every generation that preceded us, we have been endowed with a weak Messianic power, a power to which the past has a claim. That claim cannot be settled cheaply. Historical materialists are aware of that. A chronicler who recites events without distinguishing between major and minor ones acts in accordance with the following truth: nothing that has ever happened should be regarded as lost for history. To be sure, only a redeemed mankind receives the fullness of its past-which is to say, only for a redeemed mankind has its past become citable in all its moments. Each moment it has lived becomes a citation a l'ordre du jour — and that day is Judgment Day. the Kingdom of God shall be added unto you. The class struggle, which is always present to a historian influenced by Marx, is a fight for the crude and material things without which no refined and spiritual things could exist. Nevertheless, it is not in the form of the spoils which fall to the victor that the latter make their presence felt in the class struggle. They manifest themselves in this struggle as courage, humor, cunning, and fortitude. They have retroactive force and will constantly call in question every victory, past and present, of the rulers. As flowers turn toward the sun, by dint of a secret heliotropism the past strives to turn toward that sun which is rising in the sky of history. A historical materialist must be aware of this most inconspicuous of all transformations. To articulate the past historically does not mean to recognize it ‘the way it really was’ (Ranke). It means to seize hold of a memory as it flashes up at a moment of danger. Historical materialism wishes to retain that image of the past which unexpectedly appears to man singled out by history at a moment of danger. The danger affects both the content of the tradition and its receivers. The same threat hangs over both: that of becoming a tool of the ruling classes. In every era the attempt must be made anew to wrest tradition away from a conformism that is about to overpower it. The Messiah comes not only as the redeemer, he comes as the subduer of Antichrist. Only that historian will have the gift of fanning the spark of hope in the past who is firmly convinced that even the dead will not be safe from the enemy if he wins. And this enemy has not ceased to be victorious. In this vale which resounds with mystery. To historians who wish to relive an era, Fustel de Coulanges recommends that they blot out everything they know about the later course of history. There is no better way of characterising the method with which historical materialism has broken. It is a process of empathy whose origin is the indolence of the heart, acedia, which despairs of grasping and holding the genuine historical image as it flares up briefly. Among medieval theologians it was regarded as the root cause of sadness. Flaubert, who was familiar with it, wrote: ‘Peu de gens devineront combien il a fallu être triste pour ressusciter Carthage.’* The nature of this sadness stands out more clearly if one asks with whom the adherents of historicism actually empathize. The answer is inevitable: with the victor. And all rulers are the heirs of those who conquered before them. Hence, empathy with the victor invariably benefits the rulers. Historical materialists know what that means. Whoever has emerged victorious participates to this day in the triumphal procession in which the present rulers step over those who are lying prostrate. According to traditional practice, the spoils are carried along in the procession. They are called cultural treasures, and a historical materialist views them with cautious detachment. For without exception the cultural treasures he surveys have an origin which he cannot contemplate without horror. They owe their existence not only to the efforts of the great minds and talents who have created them, but also to the anonymous toil of their contemporaries. There is no document of civilization which is not at the same time a document of barbarism. And just as such a document is not free of barbarism, barbarism taints also the manner in which it was transmitted from one owner to another. A historical materialist therefore dissociates himself from it as far as possible. He regards it as his task to brush history against the grain. I would have little luck. 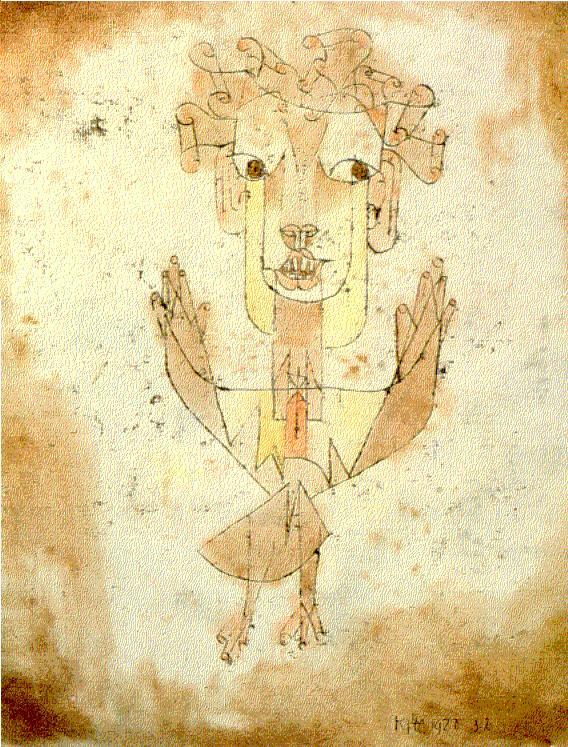 A Klee painting named ‘Angelus Novus’ shows an angel looking as though he is about to move away from something he is fixedly contemplating. His eyes are staring, his mouth is open, his wings are spread. This is how one pictures the angel of history. His face is turned toward the past. Where we perceive a chain of events, he sees one single catastrophe which keeps piling wreckage and hurls it in front of his feet. The angel would like to stay, awaken the dead, and make whole what has been smashed. But a storm is blowing in from Paradise; it has got caught in his wings with such a violence that the angel can no longer close them. The storm irresistibly propels him into the future to which his back is turned, while the pile of debris before him grows skyward. This storm is what we call progress. The themes which monastic discipline assigned to friars for meditation were designed to turn them away from the world and its affairs. The thoughts which we are developing here originate from similar considerations. At a moment when the politicians in whom the opponents of Fascism had placed their hopes are prostrate and confirm their defeat by betraying their own cause, these observations are intended to disintangle the political worldlings from the snares in which the traitors have entrapped them. Our consideration proceeds from the insight that the politicians’ stubborn faith in progress, their confidence in their ‘mass basis’, and, finally, their servile integration in an uncontrollable apparatus have been three aspects of the same thing. It seeks to convey an idea of the high price our accustomed thinking will have to pay for a conception of history that avoids any complicity with the thinking to which these politicians continue to adhere. The conformism which has been part and parcel of Social Democracy from the beginning attaches not only to its political tactics but to its economic views as well. It is one reason for its later breakdown. Nothing has corrupted the German working, class so much as the notion that it was moving, with the current. It regarded technological developments as the fall of the stream with which it thought it was moving. From there it was but a step to the illusion that the factory work which was supposed to tend toward technological progress constituted a political achievement. The old Protestant ethics of work was resurrected among German workers in secularized form. The Gotha Program * already bears traces of this confusion, defining labor as ‘the source of all wealth and all culture.’ Smelling a rat, Marx countered that ‘…the man who possesses no other property than his labor power’ must of necessity become ‘the slave of other men who have made themselves the owners…’ However, the confusion spread, and soon thereafter Josef Dietzgen proclaimed: ‘The savior of modern times is called work. The …improvement… of labor constitutes the wealth which is now able to accomplish what no redeemer has ever been able to do.’ This vulgar-Marxist conception of the nature of labor bypasses the question of how its products might benefit the workers while still not being at, their disposal. It recognizes only the progress in the mastery of nature, not the retrogression of society; it already displays the technocratic features later encountered in Fascism. Among these is a conception of nature which differs ominously from the one in the Socialist utopias before the 1848 revolution. The new conception of labor amounts to the exploitation of nature, which with naive complacency is contrasted with the exploitation of the proletariat. Compared with this positivistic conception, Fourier's fantasies, which have so often been ridiculed, prove to be surprisingly sound. According to Fourier, as a result of efficient cooperative labor, four moons would illuminate the earthly night, the ice would recede from the poles, sea water would no longer taste salty, and beasts of prey would do man's bidding. All this illustrates a kind of labor which, far from exploiting nature, is capable of delivering her of the creations which lie dormant in her womb as potentials. Nature, which, as Dietzgen puts it, ‘exists gratis,’ is a complement to the corrupted conception of labor. loafer in the garden of knowledge needs it. Not man or men but the struggling, oppressed class itself is the depository of historical knowledge. In Marx it appears as the last enslaved class, as the avenger that completes the task of liberation in the name of generations of the downtrodden. This conviction, which had a brief resurgence in the Spartacist group,* has always been objectionable to Social Democrats. Within three decades they managed virtually to erase the name of Blanqui, though it had been the rallying sound that had reverberated through the preceding century. Social Democracy thought fit to assign to the working class the role of the redeemer of future generations, in this way cutting the sinews of its greatest strength. This training made the working class forget both its hatred and its spirit of sacrifice, for both are nourished by the image of enslaved ancestors rather than that of liberated grandchildren. * Leftist group, founded by Karl Liebknecht and Rosa Luxemburg at the beginning of World War I in opposition to the pro-war policies of the German Socialist party, later absorbed by the Communist party. Social Democratic theory, and even more its practice, have been formed by a conception of progress which did not adhere to reality but made dogmatic claims. Progress as pictured in the minds of Social Democrats was, first of all, the progress of mankind itself (and not just advances in men’s ability and knowledge). Secondly, it was something boundless, in keeping with the infinite perfectibility of mankind. Thirdly, progress was regarded as irresistible, something that automatically pursued a straight or spiral course. Each of these predicates is controversial and open to criticism. However, when the chips are down, criticism must penetrate beyond these predicates and focus on something that they have in common. The concept of the historical progress of mankind cannot be sundered from the concept of its progression through a homogenous, empty time. A critique of the concept of such a progression must be the basis of any criticism of the concept of progress itself. History is the subject of a structure whose site is not homogenous, empty time, but time filled by the presence of the now. [Jetztzeit]. * Thus, to Robespierre ancient Rome was a past charged with the time of the now which he blasted out of the continuum of history. The French Revolution viewed itself as Rome incarnate. It evoked ancient Rome the way fashion evokes costumes of the past. Fashion has a flair for the topical, no matter where it stirs in the thickets of long ago; it is a tiger’s leap into the past. This jump, however, takes place in an arena where the ruling class give the commands. The same leap in the open air of history is the dialectical one, which is how Marx understood the revolution. * Benjamin says ‘Jetztzeit’ and indicates by the quotation marks that he does not simply mean an equivalent to Gegenwart, that is, present. He clearly is thinking of the mystical nunc stans. Who would have believed it! in order to stop the day. A historical materialist cannot do without the notion of a present which is not a transition, but in which time stands still and has come to a stop. For this notion defines the present in which he himself is writing history. Historicism gives the ‘eternal’ image of the past; historical materialism supplies a unique experience with the past. The historical materialist leaves it to others to be drained by the whore called ‘Once upon a time’ in historicism’s bordello. He remains in control of his powers, man enough to blast open the continuum of history. Historicism rightly culminates in universal history. Materialistic historiography differs from it as to method more clearly than from any other kind. Universal history has no theoretical armature. Its method is additive; it musters a mass of data to fill the homogoneous, empty time. Materialistic historiography, on the other hand, is based on a constructive principle. Thinking involves not only the flow of thoughts, but their arrest as well. Where thinking suddenly stops in a configuration pregnant with tensions, it gives that configuration a shock, by which it cristallizes into a monad. A historical materialist approaches a historical subject only where he encountes it as a monad. In this structure he recognizes the sign of a Messianic cessation of happening, or, put differently, a revolutionary chance in the fight for the oppressed past. He takes cognizance of it in order to blast a specific era out of the homogenous course of history—blasting a specific life out of the era or a specific work out of the lifework. As a result of this method the lifework is preserved in this work and at the same time canceled*; in the lifework, the era; and in the era, the entire course of history. The nourishing fruit of the historically understood contains time as a precious but tasteless seed. *The Hegelian term aufheben in its threefold meaning: to preserve, to elevate, to cancel. ‘In relation to the history of organic life on earth,’ writes a modem biologist, ‘the paltry fifty millennia of homo sapiens constitute something like two seconds at the close of a twenty-four-hour day. On this scale, the history of civilized mankind would fill one-fifth of the last second of the last hour.’ The present, which, as a model of Messianic time, comprises the entire history of mankind in an enormous abridgment, coincides exactly with the stature which the history of mankind has in the universe. Historicism contents itself with establishing a causal connection between various moments in history. But no fact that is a cause is for that very reason historical. It became historical posthumously, as it were, though events that may be separated from it by thousands of years. A historian who takes this as his point of departure stops telling the sequence of events like the beads of a rosary. Instead, he grasps the constellation which his own era has formed with a definite earlier one. Thus he establishes a conception of the present as the ‘time of the now’ which is shot through with chips of Messianic time. The soothsayers who found out from time what it had in store certainly did not experience time as either homogeneous or empty. Anyone who keeps this in mind will perhaps get an idea of how past times were experienced in remembrance--namely, in just the same way. We know that the Jews were prohibited from investigating the future. The Torah and the prayers instruct them in remembrance, however. This stripped the future of its magic, to which all those succumb who turn to the soothsayers for enlightenment. This does not imply, however, that for the Jews the future turned into homogeneous, empty time. For every second of time was the strait gate through which Messiah might enter.